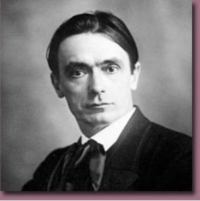 Rudolf Steiner was born in 1861 and lived until 1925. He developed spiritual science by applying the scientific method to his remarkable powers of clairvoyant perception. When observing subtler aspects of existence he could change his consciousness so that instead of experiencing the world from a central point of view his consciousness moved to the cosmic periphery. He described his findings in over 50 written works and nearly 6,000 lectures. He founded the Anthroposophical Society in 1912 and gave impulses for new more spiritual approaches to agriculture (biodynamic), architecture, the arts, education, care of the handicapped, medicine, science and social science, as well as the path of individual spiritual development. He was born in Kraljevic in Austria (now in Croatia), he read chemistry, natural science and mathematics for his degree and obtained his doctorate in philosophy. George Adams von Kaufmann was born in 1894 and lived until 1963. He read chemistry at Cambridge and came into contact with Steiner's work while a student. He was active as a pacifist in the First World War and did social work with the Quakers, in particular with the Friends' War Relief organisation in Poland. He worked for the rest of his life for Anthroposophy with a special interest in the scientific side as well as developing the social aspects. He interpreted Steiner's lectures in England and later translated many of them into English. He discovered how to describe Steiner's findings about negative space in geometric terms. He worked particularly with projective geometry and the application of path curves. Lawrence Edwards (1912 -2003) studied the work of Rudolf Steiner and as a result he became a Class Teacher as well as an upper school mathematics teacher at the Edinburgh Rudolf Steiner School until he retired. He was inspired to carry out scientific research after studying projective geometry with George Adams, following a "moonlighting" second career testing whether the path curves he had learnt about applied to real forms in Nature. This he confirmed for the forms of many flower and leaf buds as well as for the human heart. He found important rhythmic processes active in leaf bud forms over the winter months which correlate with planetary rhythms. He was a friend, inspirer and helper to many others. Nick Thomas was born in 1941, educated as an electrical engineer, and became an engineering officer in the RAF for 16 years. He met the work of Rudolf Steiner at the age of 18 and has been inspired by it ever since. In particular he seeks to reconcile Steiner's spiritual research with the findings of science, and has found projective geometry to be a beautiful and appropriate approach. Lawrence Edwards befriended him early on and helped him greatly. Some of his interests and work are outlined in these pages. 1. The Philosophy of Spiritual Activity, Rudolf Steiner, Rudolf Steiner Press, London 1979. 2. Space and the Light of Creation, George Adams Kaufmann, Published by the Author, London 1933. 3. Universal Forces in Mechanics, George Adams, Rudolf Steiner Press, London 1977. 4. The Lemniscatory Ruled Surface in Space and Counterspace, George Adams, Rudolf Steiner Press, London 1979. 5. The Plant Between Sun and Earth, Adams and Whicher, Rudolf Steiner Press, London 1980. 6. Projective Geometry by Lawrence Edwards, Rudolf Steiner Institute, Phoenixville 1985. 7. The Vortex of Life, Lawrence Edwards, Floris Press, Edinburgh 1993. 8. Projective Geometry,Veblen and Young, Ginn & Co., Boston 1910 (a classic). 9. Projective Geometry, Dirk J. Struik, Addison-Wesley Publishing Co., London 1953. 10. Geometry, H.S.M. Coxeter, John Wiley & Sons, New York, 1969. 11. Algebraic Projective Geometry, Semple and Kneebone, Oxford University Press, Oxford 1952. 12. Projective Geometry, T.E. Faulkner, Oliver and Boyd, Edinburgh and London 1960. 14. Science Between Space and Counterspace, N.C. Thomas, Temple Lodge Publishing, first published London January 1999. This is a less-technical version of the first book with some added material. and the diagrams referred to (PDF file). The main document and Annex 3 have been amended for greater clarity. geometry in PDF format illustrated in colour, with special reference to path curves. Part 2: three dimensional projective geometry followed by introduction to the algebraic approach. Part 3: Imaginary elements a brief introduction to imaginary points, lines and planes. 17. Introduction to Tetrahedral complexes includes chaos in projective geometry (PDF format). 18. Practical Path Curve Calculations, N.C. Thomas (PDF format).